Each Alert Trigger has a different function and alerts can be created for price, trend line and technical analysis indicators. If you hover your mouse over the Alert Trigger buttons on the CHART page, a brief description of the Alert Trigger will be displayed. Click the trendline trigger buttons to create alerts to execute trades, or notify you, when the price rises above or falls below a trendline you have drawn on the chart. The trendline trigger buttons are only displayed after a trendline has been selected by clicking on it. To create your alert, simply click on the appropriate trigger button whose change in conditions you wish to be alerted about. For example, if you are creating a price alert, use the trigger buttons located in the bottom left corner of the price chart. If you are creating a MACD alert, use the trigger buttons located in the MACD chart. 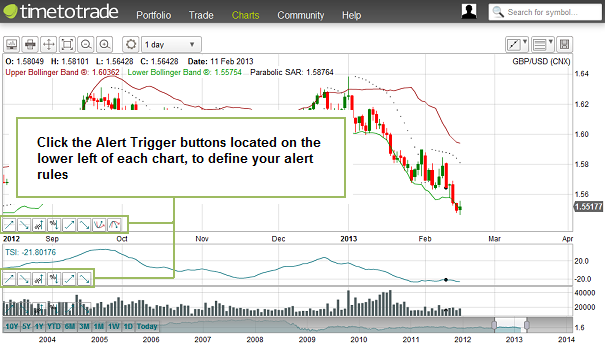 If you are creating a Stochastic alert, use the trigger buttons located in the Stochastic chart, etc. Some triggers require you to input values in the relevant text boxes which will appear as a pop out on the chart. After clicking on a trigger button, the alert conditions will appear in the "Alert Builder" widget - to the right hand side of the chart, where you can further edit and customise the alert to suit. We will look at some examples in the following tutorials. To learn more about Triggers and Grouping Alert Triggers click here.